Ever since walking the rain-soaked streets of NYC in my athletic shoes, I’ve been determined to get a proper pair of rain boots. I’m 41 and have never owned a pair! #thehorror I think the typical high price tag for a quality pair and my doubtful mindset, “how often would I really wear them?” kept me from making the investment. 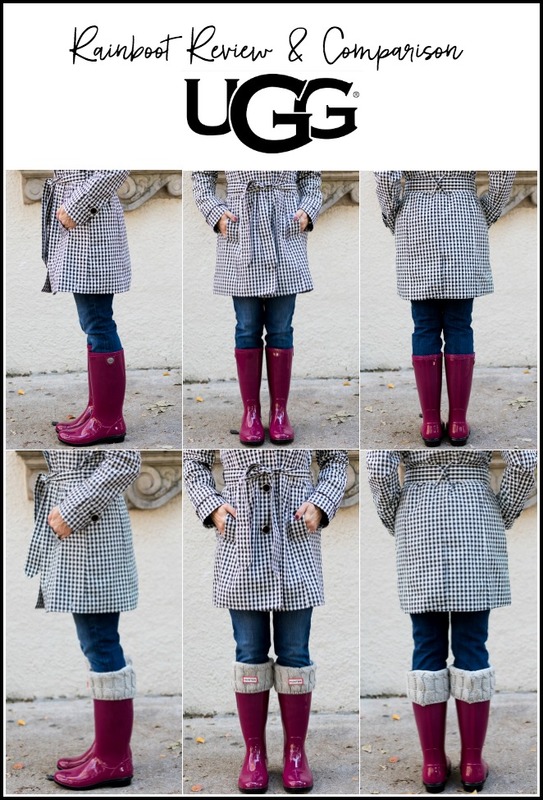 But, when you need a pair of rain boots, nothing else will do! Wet socks and cold feet are no fun! Some people might actually use a public restroom handdryer as a means to try and dry their socks. For example. 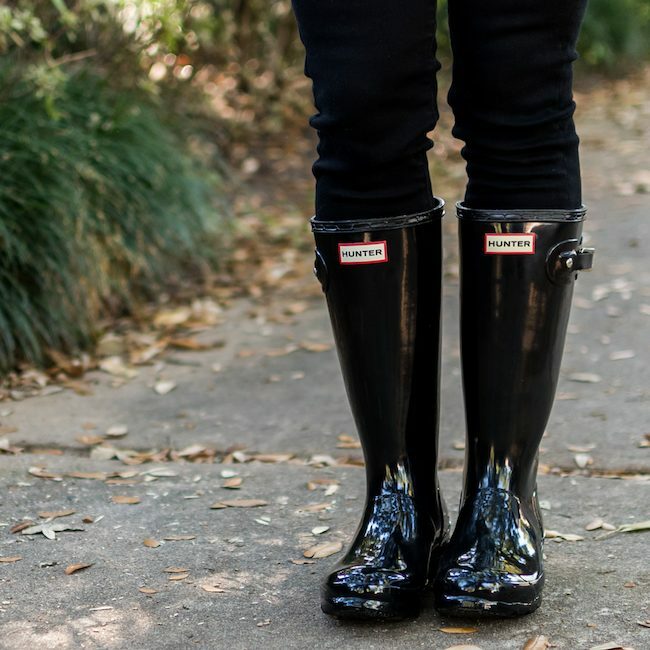 In Houston, I’d probably get more use out of rain boots than I do a heavy coat since we get tons of rainy days here. But which ones to buy? 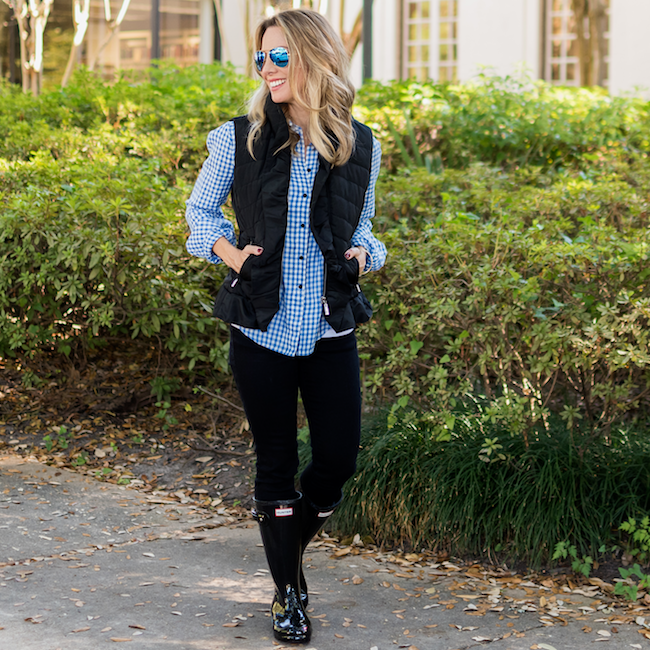 I’ve heard so many people rave about their Hunter rainboots, so I definitely wanted to give them a try and then I also saw pretty cute pair of UGGs and you know I’m a fan of those. 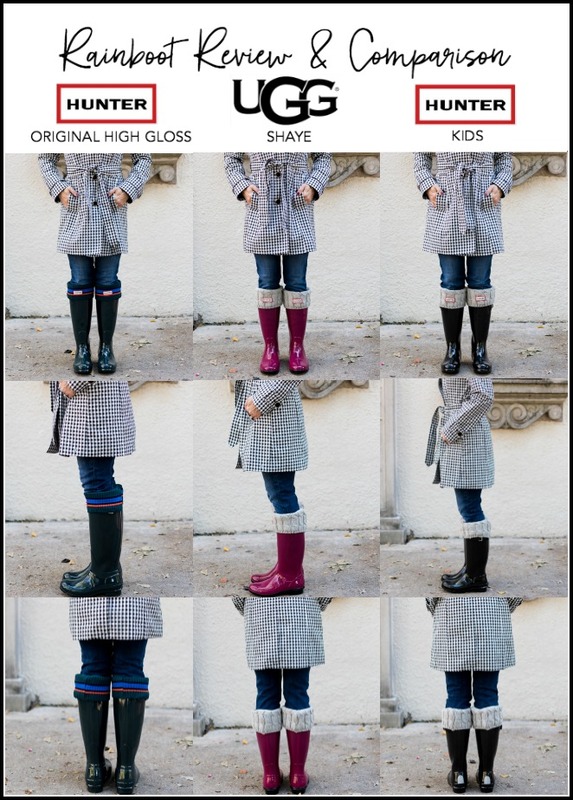 Finally, I wanted to compare the women and kids Hunter boots because I was thinking, for a petite person like myself, we might be able to get away with those at half the price!So, I tried the Hunter Original High Gloss Boot, the UGG Shaye Rain Boot, and the Kids Hunter Boots, all from my fave Nordstrom, and I’m giving you the comparison and pros/cons of each below. Too bad I just saw the new Hunter wedges (tall and short). I love a wedge and those are super cute! 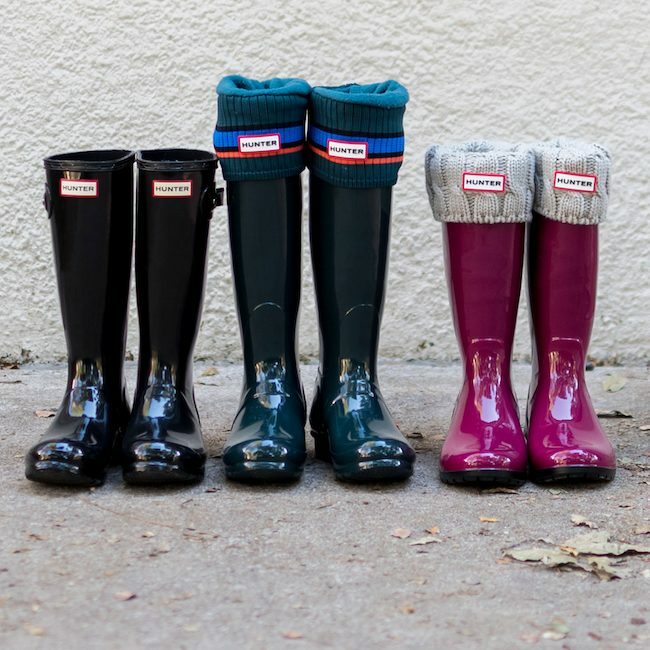 Hunter Original High Gloss Boot | UGG Shaye Rain Boot | Kids Hunter BootsShiny goodness! The first pair are black and the middle are “ocean” which happen to be 40% off right now. Nordstrom has tons of cute rain boot socks, so it’s fun to change the look with different colors and even the striped ones! The striped ones are 33% off now and come in three colors! Here’s the run-down on all three:Original High Gloss Boot : This pair was comfortable (with socks) in the foot part and leg lengthening with the taller shaft, but also hit my knee right at the kneecap, which I didn’t enjoy. Also, without the thick sock, this one felt big on my foot. 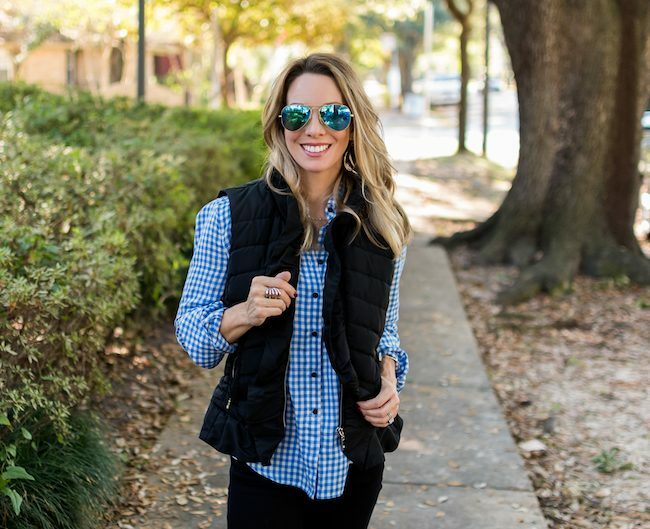 They come in lots of gorgeous colors and the bright red is particularly festive and fun for the holidays, but they are also the priciest at $150, so you want to make sure they are worth it. These are the tallest with a 16 inch shaft and 16 inch calf circumference. UGG Shaye Rain Boot : This boot was the one with a slightly higher heel by 1/4 inch, but still super comfy. It’s got shearling inside, which is ridiculously cozy, but ultimately, I felt it would be too warm for Houston’s mild weather. These have a 12 1/2 inch shaft and 16 inch calf circumference. They also are a great price at the same as the Kids Hunters and also come in grey, black, and dark green. Kids Hunter Boots : This boot is just 1 1/2 inch shorter (11 inch shaft) than the Original Hunter, so it hit my leg a few inches below my knee. To find your size in a kids shoe, you just take your regular size minus two, which put me in a Kids Size 4 and they fit my foot perfectly. It’s slightly annoying (for adults) that the kids’ boots have a small reflective patch at the back of the heel and back top of the boot, but if you wear them with socks, the top reflective patch will be covered. It didn’t keep me from choosing this pair because the fit was good and the height was nice for a petite person. Also, they didn’t feel heavy on my foot, which I liked. 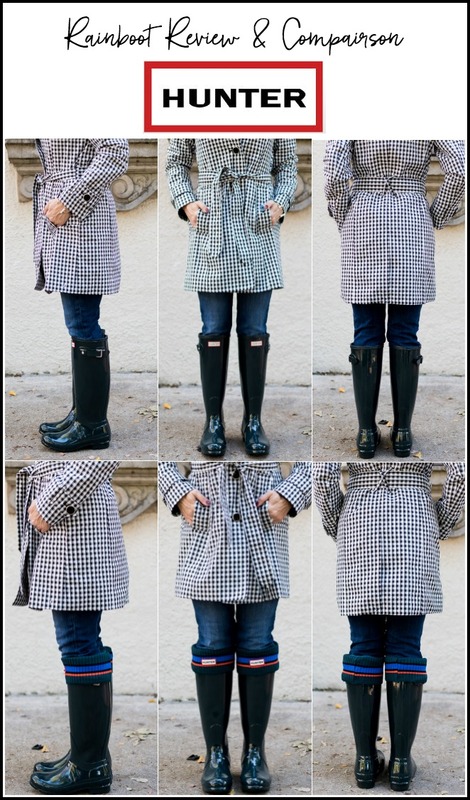 And you don’t have to save your rain boots for rainy days. They are comfy enough to wear on your casual days running errands and such. For Fall and Winter, I absolutely love them with a puffer vest, button down top, and Black Skinny Jeans. These are those crop jeans I was telling you about here and how awesome they are because they tuck you in an keep everything looking taut, without being uncomfortably tight. They also run true to size (I’m in 25). Because I’m only 5’1, then hit just at my ankle, which I love! Below is a better look at that reflective part I was talking about. If you wore them out trick-or-treating recently, or dog-walking at night, you might actually appreciate that! 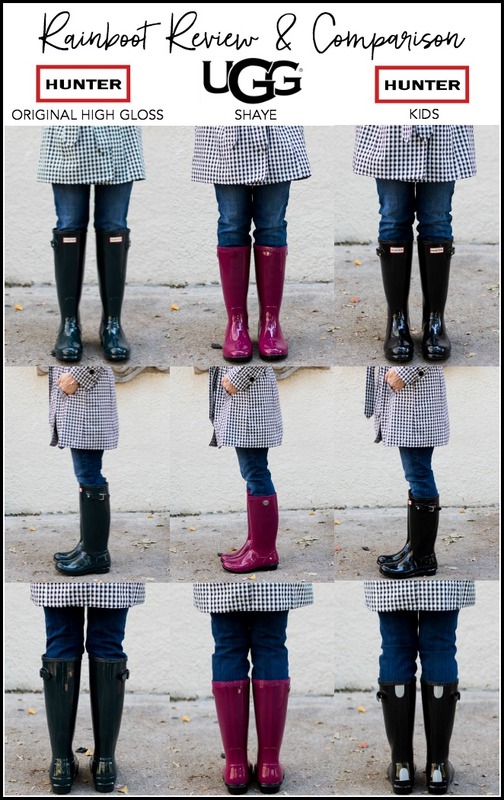 How long did it take you to invest in rainboots? Which ones do you love? I bought my first pair when I was traveling up to NYC every week for work. I picked out a pair that would flatten when smooshed in my suitcase (technical word right there!). They were before the era of the stylish rainboots though. I've looked at Jean's review from extrapetite.com and she seems to come to your conclusion too! I am still regretting not buying the kids pair from Costco last Fall when they had them! Packable is a bonus for sure! I always forget about Costco! They'd be perfect for that! We got the girls each Hunters when they went off to college. Walking to class in the rain in athletic shoes just doesn't cut it. I have two pairs of Sperry boots I love, one tall, one short. 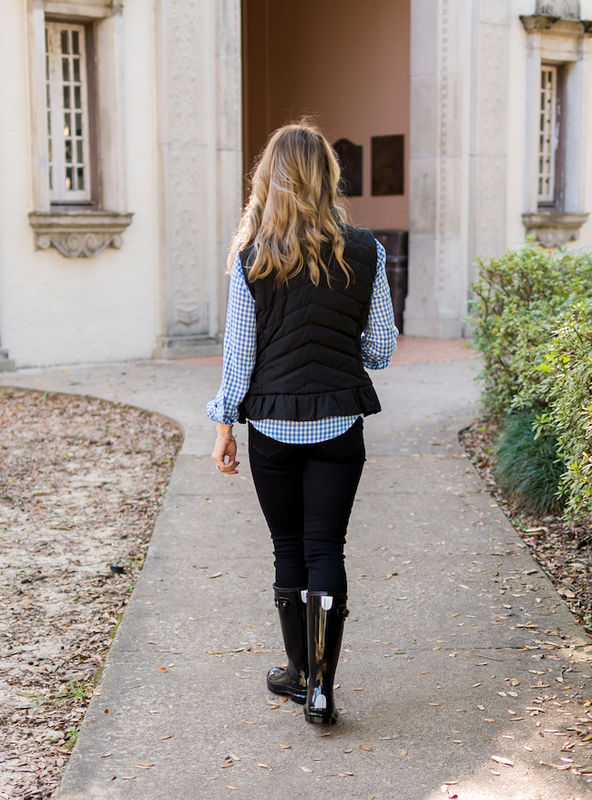 Hunter does make a shorter boot for those that are petite and maybe can't fit in a kids size. Athletic shoes and rain do not mix! 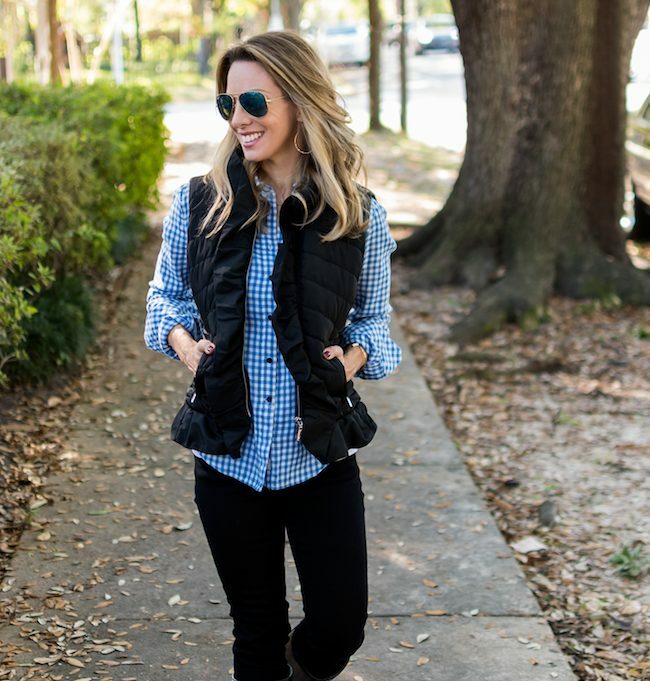 Now that you have them, you won't believe how many opportunities you'll have to wear them! Plus, it makes rainy days so much fun! Fun instead of dreadful will be nice! 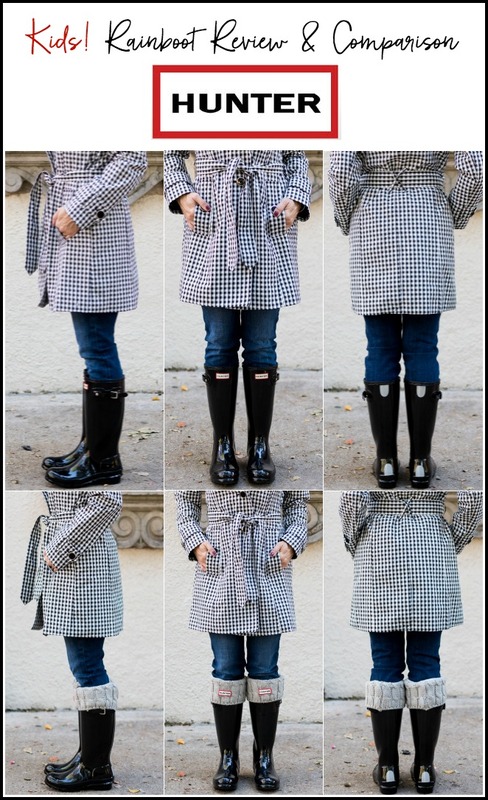 I bought some classic black Hunter boots on sale at Nordstrom summer of 2015 and found that I wore them as much in the Illinois slush and snow as I did the rain. Good point! Would've been good for that when I lived in Ohio too! I may have recently moved to south Texas, but I'm from Seattle so I have a few pairs of rain boots! 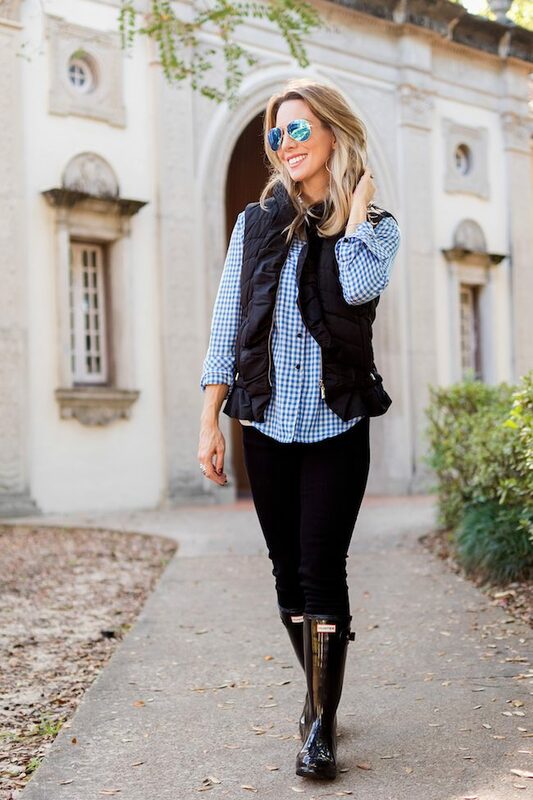 I really like my Hunters because they are great for not having to worry about puddles and mud, but my favorite pair are my Burberry rain boots, they are so comfortable and easy to walk around in, the foot part fits more like a shoe for me. 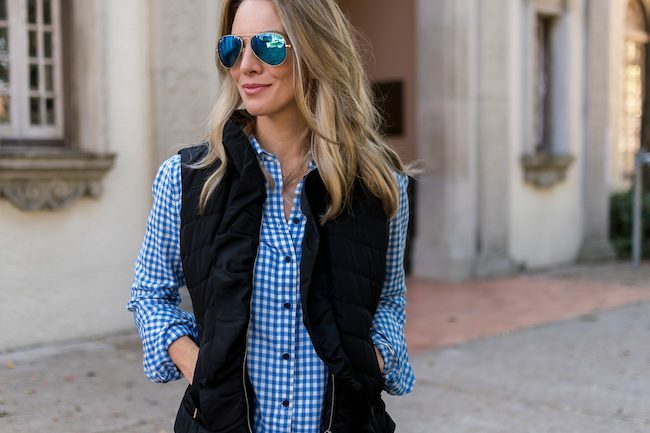 I bought Hunters once and they are pretty with their glossiness, but after research I discovered alot of poor reports about their quality. Apparently the way and place they are made has changed and people report the rubber seperating after only a year or 2. I decided to go with Le Chameau rain boots and they are well made!